Diaphragm paralysis can involve one hemidiaphragm, which is known as unilateral diaphragmatic paralysis, and both hemidiaphragms, which are known as bilateral diaphragmatic paralysis . Unilateral diaphragmatic paralysis can be seen during head, neck, and cardiovascular operations due to phrenic nerve injury . Thoracoabdominal trauma, sub-phrenic abscesses, atelectasis, and pleural infection are considered to be the causes of diaphragm paralysis when the phrenic nerve is not involved . Unilateral diaphragmatic paralysis patients usually have no symptoms , but they may experience dyspnea on exertion . While repairing diaphragm paralysis, there are surgical procedures including plication of the diaphragm, which have several open and minimally invasive approaches  as well as resection of the diaphragm . We report the case of a 49-year-old man with unilateral diaphragmatic paralysis who underwent laparoscopic resection using staplers. 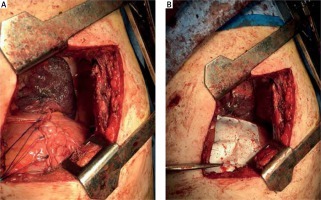 He then underwent thoracotomy by using mesh reinforcement due to the unsuccessful initial procedure. A 49-year-old man, who had a long-term history of asthma and dyspnea, exhibited an elevated left hemidiaphragm on his chest radiograph and computed tomography (CT) scan. Diaphragm paralysis was diagnosed through a chest radiograph and a CT scan. The patient underwent a surgical resection of the diaphragm using laparoscopy. He was placed in the supine and reverse Trendelenburg position. The surgical operation was carried out under general anesthesia and one-lung ventilation. By perforating the left hemidiaphragm and developing pneumothorax by using an atraumatic single grasper, we pulled the middle segment of the diaphragm down into the abdomen. Then, we transversely resected the bulged portion of the diaphragm using a tri-stapler. The procedure was concluded by inserting the chest tube in the left thorax cavity and converting one-lung ventilation into two-lung ventilation (Photo 1). The day after the surgical procedure, the patient had low O2 saturation, tachypnea, and dyspnea. His chest radiograph showed an opening of the diaphragm and the entry of the gut into the thorax. Then, we performed thoracotomy and reduced the herniated contents to the abdominal cavity and repaired the diaphragm with reinforcing mesh (Photo 2). The patient’s clinical status was thus improved. Timeline of intervention of outcome was presented in Figure 1. Surgical resection of the diaphragm, another intervention for repairing diaphragm paralysis, is revealed to clinically improve patients with unilateral diaphragm paralysis . Several studies have indicated that diaphragm plication, using various techniques [3, 7–9], improves symptoms and respiratory function. A recent report on a patient with diaphragmatic paralysis, who underwent laparoscopic diaphragmatic plication using intermittent sutures, reported an improvement in the patient’s clinical status . A case series of three patients with hemidiaphragm paralysis, who were treated with laparoscopic plication using robotic assistance, reported the clinical improvement of the patients. They carried out plication with interrupted horizontal sutures . Another case series of 21 adult patients with diaphragmatic hernias and eventration, who underwent laparoscopic repair, reported the successful management of the patients. Larger defects were repaired using both suturing and mesh reinforcement, and smaller defects were repaired using simple suturing alone . 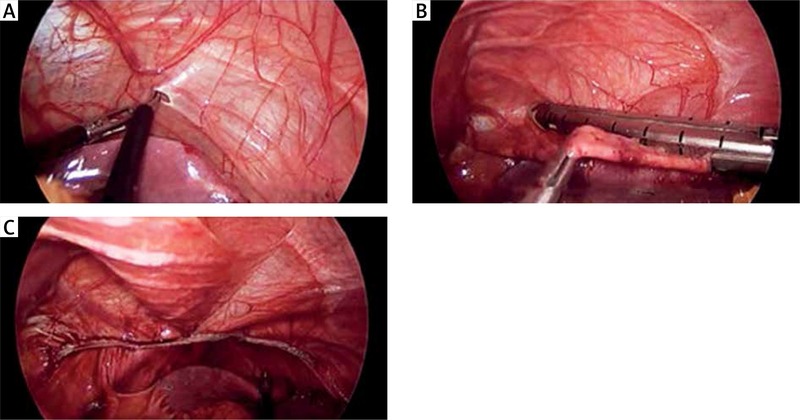 Laparoscopic diaphragmatic plication, with thoracoscopic verification in patients with unilateral diaphragm paralysis, has been described by Welvaart et al. Diaphragmatic plications were performed using running nonabsorbable sutures and simple plications were performed using full-thickness horizontal mattress sutures. A significant improvement of the preoperative symptoms of dyspnea and orthopnea was reported . There is a report in which diaphragm plication is performed using staplers. Jin et al. revealed that thoracoscopic plication with knifeless endostaplers improved the pulmonary functions and the dyspnea of the patient, who experienced dyspnea on exertion and left diaphragm elevation . A study of 36 patients with unilateral diaphragm paralysis revealed that diaphragm resection improves the clinical status of patients . This was not observed in the present report. Using staplers in the surgical resection of the diaphragm led to worsening of the patient’s clinical status and provided inappropriate safety, due to disruption of the stapled area of the diaphragm. We strongly recommend performing plication alone without resection or resection with mesh reinforcement to prevent disruption. Based on our report, using staplers can result in failure of surgical resection of the diaphragm. We can conclude that any diaphragmatic resection without reconstruction is not safe and effective in diaphragmatic paralysis and is not a good alternative to plication. Using bladeless staplers or surgical threads, in order to decrease the injury of the diaphragm, and thoracoscopic or laparoscopic mesh reinforcement which provides more stability, are suggested to prevent diaphragmatic disruption. We gratefully appreciate the patient and her family for their cooperation in this manuscript. The patient signed an informed consent form letting us use his document information to write this case report.